SHARK-FUN-flyer! As inventors of the world-famous EasyStar, we decided that our next aeroplane would be a modern, user-friendly design which would guarantee a one hundred percent FUN factor. We wanted to create a model which could grow as the owner’s skills developed, and would never become boring. Ready To Fly version with Hitec radio, LiPo battery and charger. RTF with Hitec 5ch radio, receiver, battery and charger. All items included to fly. As inventors of the world-famous EasyStar, we decided that our next aeroplane would be a modern, user-friendly design which would guarantee a one hundred percent FUN factor. We wanted to create a model which could grow as the owner’s skills developed, and would never become boring. The outcome is something very special - the MULTIPLEX SHARK! The SHARK looks terrific in its unusual colour scheme, and it flies fantastically well. 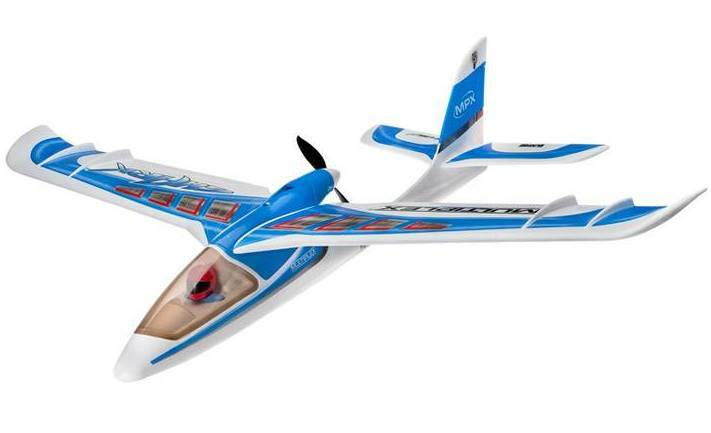 In its standard form the model is controlled using rudder and elevator, but it is prepared for the aileron option. With the recommend 1000mAh, 3S1P, 11.1V, 25C/4C flight battery a minimum flying time of 11 min is possible! It takes just a few moments to fit an undercarriage to the aeroplane, and with a further “click” it is transformed into a float-plane which provides loads of fun - on snow as well as water. We think every MULTIPLEX SHARK owner should have this optional accessory. And for the aesthetically demanding modeller we can supply a stylish protective landing skid. When all the flying fun’s over, the SHARK can very easily be dismantled and packed back into the original carton. Highly practical!